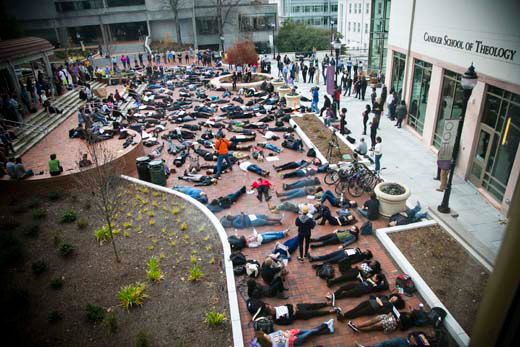 Members of the Emory community held a "die-in" Dec. 4 to protest police killings of black men. The upcoming university course on "The Ferguson Movement" is "taking an issue that's been identified by some students and faculty at Emory as important to them and creating another way for the conversation to happen," says co-convener Pamela Scully. Emory Photo/Video. The "Ferguson Movement" University Course is open to all students — undergraduate, graduate and professional. Those interested in applying should email cfde@emory.edu with your name, year, school and major/minor by Wednesday, March 18. "The Ferguson Movement: Power, Politics and Protest" will be Emory's Fall 2015 University Course, a class experience that unites students and faculty from across the university for an intensive, multi-disciplinary exploration of a subject of common concern. Coordinated through the Center for Faculty Development and Excellence (CFDE), the fall course is designed to contextualize the August 2014 police shooting death of Michael Brown in Ferguson, Missouri, within the larger discussion of race, politics and power in the United States. The aim of the course is to help participants think broadly about the impact that Brown's death — and the overwhelming public response to it — has had on contemporary society, says Dorothy Brown, Emory vice provost of academic affairs and professor of law, who helped create the course. Through a discussion of topics that include policing, media, voting rights, tax policy, and state and local politics, among others, the course will ask "what critical issues in our nation's history have set the stage for the 'Black Lives Matter' movement" and what the future holds, Brown says. Given the university's scholarship strengths, Atlanta's historic role in the American civil rights movement, and the unique resources of Emory's Manuscript, Archives and Rare Book Library (MARBL), "this is a great fit for Emory," Brown says. "We have so many people here working on so many issues that are relevant to the Ferguson movement, from why it is that this majority black area has almost all white representation policing their community, to how revenues are raised, how state and local governments relate to each other, and the role of the black church," she says. "Our research is rich." "The Ferguson Movement" is the first University Course to be organized at Emory around a theme identified by the CFDE — all previous courses have arisen from faculty identifying a topic they wish to teach, Brown notes. Emory students have already shown an interest in the topic, as evidenced by a December 2014 protest that drew more than 200 members of the Emory community to a "die-in" event held outside the Candler School of Theology, says Pamela Scully, assistant vice provost for academic innovation, CFDE director and professor of women's, gender and sexuality studies and African studies. The event was held in protest of a grand jury's decision not to indict New York City police officer Daniel Pantaleo, who was accused of killing an unarmed man, Eric Garner, through a chokehold. The New York decision came close on the heels of another grand jury's refusal to indict Ferguson police officer Darren Wilson in Brown's killing. The deaths of two black men by white police officers sparked protests in cities across the country, as well as an outcry on social media with hashtags such as #blacklivesmatter. "This course is taking an issue that's been identified by some students and faculty at Emory as important to them and creating another way for the conversation to happen," Scully says. "We're trying to participate in making Emory a place that includes both students and faculty in those conversations in a whole range of places and spaces." It will also provide "a phenomenal opportunity for Emory to meet Emory," Brown adds. "We have faculty from nearly every school represented in this course." The course brings together a robust roster of nearly two dozen faculty experts from across the university to engage in multi-disciplinary discussions about the topic, says Associate CFDE Director Donna Troka, an adjunct assistant professor in Emory's Graduate Institute of the Liberal Arts, who joins Brown and Scully as co-conveners for the class. Faculty from the Emory College of Arts and Sciences, School of Public Health, Goizueta Business School, School of Law, School of Medicine, and the School of Theology are scheduled to lead discussions throughout the semester, Troka says. When the CFDE issued a call for Emory faculty participants for the topic, the response was so enthusiastic that the resulting class schedule will double up, featuring two guest lecturers every day, she notes. Emory faculty who will be teaching the University Course this fall represent disciplines that encompass African American studies, political science, history, law, public health and medicine, religion, and journalism. Students may take the three-credit course for a grade or pass/fail.